Is there anyone left out there who still believes that officially published inflation rates do not understate actual inflation? This morning I learned that gas and oil prices have been rising faster than the energy CPI for years — a result which fails to resonate with my common sense. The chart below was constructed using data from FRED2. I took oil and gas prices, deflated each series by the official energy CPI, and marveled at the results. Since 1994, gas prices have risen 2.8% per year faster than the energy CPI, and oil prices have risen 9.6% per year faster. 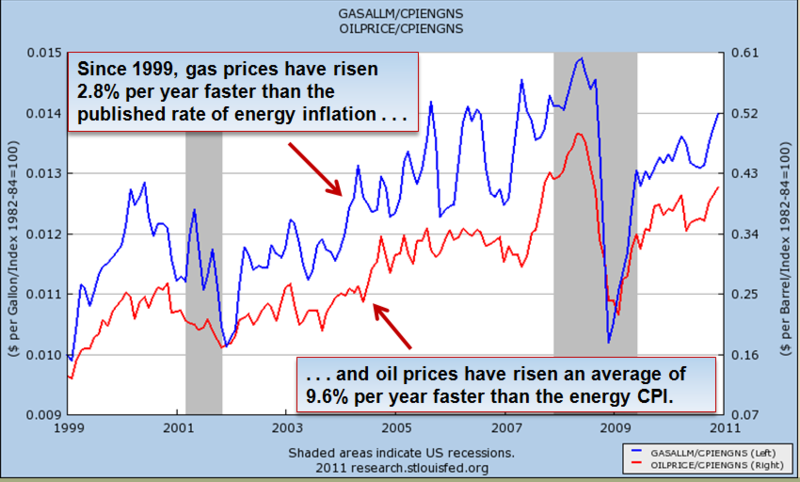 Are gas and oil prices being hedonically “adjusted” (manipulated) downwards when incorporated into the energy CPI? Or are other components of the energy CPI deemed to be “better” each year, and thus deserving of hedonic adjustments? Electricity, perhaps? That is definitely a concerning margin of difference. I could no agree more with your sentiment. What about taking the reading off core-CPI ex food and energy? Why would you do that when Food and Energy are such a large component of the overall household spend. Most Govt stats are strange at best but we lack a better alternative at this point.